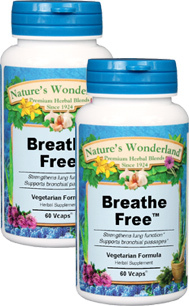 Breathe Free™ - 450 mg, 60 Veg Capsules each (Nature's Wonderland) - Penn Herb Co. Ltd. Seasonal and environmental sensitivities - be it smoke, pollution or allergens – can result in respiratory discomfort. Penn Herb’s Breathe-Free™ blend supports healthy lung function and helps maintain healthy breathing. Angelica Root, Speedwell…traditional lung and bronchial support herbs. Buckthorn, Celandine, Centaury…supportive cleansing herbs help the body flush toxins. Rosemary…antioxidant spice soothes the throat and safeguards the respiratory system. Nourish and Protect Respiratory Health with Breathe-Free™. Maintains healthy breathing; supports healthy lung function; soothing support for mucus tissue, such as the throat and respiratory system; supports healthy bronchial passages.